How have you prepared for midterms so far? What do you plan to do in the next couple of days to get ready? Are you prepared for midterms? i dont think that i have done enough studying so far so i have to keep studying until i ave it all packed. So far I have been doing my homework in which it helps me review the stuff for each class. I plan to really pay attention in class and do all my work this week. I DONT REALLY STUDY BUT IF I DID I WILL STUDY IN A QUITE ROOM WITH BACKGROUND MUSIC ALONE!!!! I have studied for the last two weeks for the midterms.And over the next few days i will ask my teachers for help when needed. i think i am perpared for the mid term. for the next couple of days im going to revew for the midterm. Im going to try and study so I can pass. I am going to go over my work that i have done in the past weeks. I am going to review all i know. Im going to study hard so that i can do well. Well i have been doing my homework and classwork so i kind of know most of the stuff. I will study and pay more attention in class this week. I have been studying in my room. I am going to keep studying in my room….. The best way to study for an midterm is to study every night when u done with your home work and study for every class for you can try to pass it and get an good score for the midterm. what do i plan to do in the next couple of days to get ready i plan to study look over all thenotes we took and try to get a good grade. TO GET PREPARED FOR THE MIDTERM.DO MY BEST AND WORK HARD SO I CAN HAVE A GOOD GRADE.I PLAN TO WRAP FOR THE MIDTERM THAT WE HAVE NEXT CLASS. I am not prepared i will be more comfortable if i studied with the teacher. to prepare for the midterm i am going over my manela folder and reviewing the things that i think are the most important and that will come out in the midterm i am going to keep on doing that to be more prepare until i take the midterm. Man that icecream sanwich look bomb.see mr chardon now im hungry.well i just looked back at notes and reread some things…. 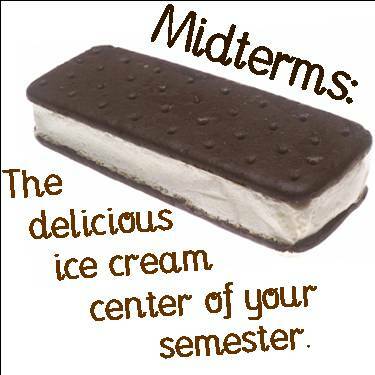 How have youn prepared for midterm so far? What do you plan to do in the next couple of days to get ready? The things thayt i studied in the past few days was the things that i studied in class………..
i am not prepaed i will be more comfortable if i studied with the teacher..
yes i got a little bit of studying done.i just plan to study real hard and be prepared. ¡I HAVE BEEN LOOKING ON MY NOTES AND STUFF…I WILL KEEP ON SYDYING AND LOOKING AT ALL MY WORK! SO FAR I HAVE STARTED LOOKING THROUGH MY WORK FROM THE LAST UNITS.I ALSO STARTED THE H.W. #11 THE REVIEW.I WILL STUDY AND GO THOUGH ALL MY WORK REREAD THE MOST IMPORTANT THING AND WANT I DONT UNDERSTAND. I Got Alot of Studying Done. && Now I Have To Go Over All The Work Ive Done So Far From Unit 3. I HAVEN’T DID ANYTHING THAT HAS TO DO WITH THE MIDTERMS. I PLAN TO REVIEW ALL MY HOMEWORK, AND CLASSWORK. I plan to study all of my classes and pass them all.I will take out all the work that the teachers have given me and study them all. yES !!!!!! !iVE BEEN STUDyiNG By LOOKiNG THROUGH ALL My NOTES……i PLAN TO STUDy WiTH ALL My FRiENDS SO T?HEy COULD HELP ME ON ANyTHiNG i NEED HELP ON. I HAVE BEEN STUDING FOR MY MIDTERMS. BECAUSE I REALLY WANT TO DO GOOD ON THEM. AT LEAST I WANT A 90 PERCENT ON MY MIDTERMS. SO FAR I HAVE BEEN STUDING AND PAYNG ATENTTION IN ALL OF MY CLASSES. I have done my work and homework for all my classes for the past couple of weeks. I plan to study and to pay more attention also to not goof off. I HAVENT STARTED STUDYING YET BUT WHEN ID DO I’LL MAKE SURE I STUDY REAL HARD SO I CAN GET ALL 100 POINTS ON THE MIDTERMS. I will go home and take out my study work and just study.I plan to study real hard and ace the midterm test. I would pay attention and take notes in class. I HAVE STUDY BY MYSELF.I HAVE HAD MY FRIENDS QUIZ ME.FOR THE NEXT COUPLE OF DAYS I WILL KEEP STUDYING. Yes i am perpated for midterms. i plan to study by looking over my papers. I PLAN STUDYING BY REVIEWING THE WORK OF THE LAST FEW UNITS. NO I AM NOT PREPARED FOR THE MIDTERMS I HAVE TO STUDY FIRST. I STUDIED A LITTLE BIT. I PLAN TO READ AND WRITE A SUMMARY FOR ALL THE INFO WE STUDIED ALREADY IN HERE!!!!!! I THINK I WILL STUDY MORE LIKE DO ALL MY H.W AND CLASS WORK BECAUSE I WANT TO HAVE A GOOD GRADE IN THE MIDTERMS.(^_^)…………………….. Well What I Would Do Is Juss Review All The Papers The Teacher Has Givin Me In Class …&& I Plan To Study More Frequently In The Next Couple Of Days.. I HAVE BEEN STUDY ALOT FOR MIDTERMS…I REVIEW ALL MY NOTES I ALSO QUIZ MY FRIENDS ….THE NEXT COUPLE DAYS I WILL STUDY MORE!!!! i have not been studing but for the next few weeks i will be reviewing all my work. DO ALL MY HOMEWORK AND STUDY BY MYSELF. no i am not prepared for the midterms i have to study first . Well i havent study but if i have to pack and get myself together then i will study hard. I HAVE PREPARED MY SELF BY TESTING MY SELF AND MAKING MY OWN NOTES ON POWER POINT.I AM PLANNING TO STUDY AND DO WELL IN MY MIDTERM. I AM PREPARED BUT STILL HAVEN’T STUDIED FOR THE TEST GOOD.AND I’M JUST GOING TO GO OVER ALL THE STUFF I DO KNOW. I really haven’t prepared for the midterms. Well I kinda prepared for it by doing my homework.In the next couple of weeks I will study by looking over at all my notes and taking notes in class.I will try to study as much as I can. id review the impartant information. How have I prepared my self for the midterms so far is studying really hard,staying after school on geting somethings clear that i don’t really understood before, making my self some question to answer them, working with a partner..ect..What I plan to do in the couple of days to get ready is study really hard, go over my notes 2 to 3 times,review with a friend or a teacher…. I dont study or do my work but i have to do it any ways so Im gonna try to see if i have a time were can do my work!!! WELL I STUDIED ALL THE WORK WE HAVE BEENDOING SO FAR IN CLASS………WELLIPLAN ON QUIZZING MYSELF ON THE PAST WORK WE HAVE HAD. I have been looking at all my past work and refreshing my memory.I plan to remember everything for the Midterm. I WOULD STUDY BY MYSELF AND HEARING MUSIC THAT IS LOW.ALSO BE TAKING TEST WITH A PARTNER. well I had loocked through my old papers.I’m going to try to study harder. I DONT STUDY OR DO MY WORK BUT I HAVE TO DO IT ANY WAYS SO IM GONNA TRY TO SEE IF I HAVE A TIME WERE CAN DO MY WORK!!!!!!!!!!!!!! yeah in this class i think im ready i enjoy this class so i think ill do good. I will study and probably get a friend to quiz me. Maybe i’ll rewrite some stuff. try to spend more time on reviwing the things i dont get. I PREPARED MYSELF BY STUDY WITH MY SISTER , SO SHE CAN HELP ME UNDERSTAND THE WORK. ALSO BY LISTENING TO THE CLASS AND BY TAKE NOTES. I will study and review my homework and take notes to pass the midterm. i have got prepared by reviewing all of my notes, classwork, and homework. i am planning to continue doing the same thing for the next couple of days!!!! TO PREPARE I HAVE BEEN READING MY OLD NOTES BUT I HAVENT STUDY MUCH.I PLAN TO STUDY OVER THINGS I DONT REMEMBER. I have looked over all of my work that we’ve done so far.I think I’m ready for the midterm! I don’t plan on failing this time. THE ONLY THING THAT I WOULD DO IS STUDY WITH A FRIEND,BECAUSE WHEN YOU STUDY ALONE YOU WILL FORGET EVERYTHING YOU STUDIED. WELL I HAVE REVEIWED SOME OF THE PAST ASSIGHNMENTS .I PLAN TO STUDY AND GET READY. To with my brothers and sisters. I PREPARE BY STUDY WITH A FRIEND..WHAT I PLAN TO DO IN THE COUPLE OF DAY IS BY REVIEWING THE QUSTION THAT I DONT KNOW.. I plan to study so I wont fail the class.I am going make myself reread the paper twice and take notes off of it. i havent studyed for the midterm but I plan too. I plan to study and review what we have done in class. I have done my midterm review homework assignments to get ready for the midterms. I also plan on looking through my old homework assignments to get ready for my other midterms. Studying and trying my best.What I will be doing is studying some more.I will also look over all units. I PLAN TO STUDY ALOT!! So far I have been doing my homework in which it helps me review the stuff for each class. Well right now nothing; But later on I’ll be studying. Like Duh! STUDYING!! which is great to get my grades up then an B. The way I’ve been getting prepared is by going over the worksheets.Doing all my H.W. ( — _ — ) Zzzzz…! the way i get ready is go over the review sheet. the revew sheet have helped me alot because it tells me wat to study…..wat am going to do is listen in class!!! i been studing with my teacher and starting on #11 for the midterm.